Last weekend, The Academy Is… performed their debut album, Almost Here, in it’s entirety at Riot Fest Chicago! 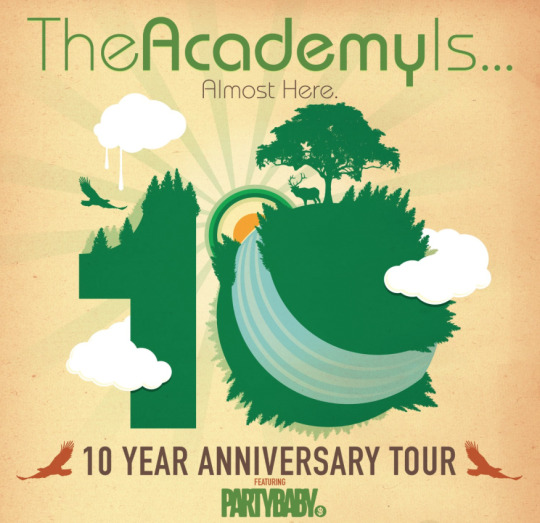 Just days later, the band announced they would be hitting the road this winter with PartyBaby for a 10 year anniversary tour for Almost Here! Tickets are currently available for pre-sale where fans can purchase special ticket packages. Though limited, VIP tickets include a ticket to the show with early entry, pre-show hangs and an individual Polaroid with the band, exclusive hand-made print by the Butcher, pre-signed and numbered Almost Here 10 Year Anniversary posters and exclusive VIP cloth bracelets. Fans can also purchase side stage and/or post-how bus hang packages, all of which are available here! The full list of dates can be found below!